Obviously, I wasn’t making much of an impression. Worse still, I was running late. I was supposed to meet Per Gabell, the genial Swede who runs Volvo do Brasil in fifteen minutes (an unbreakable appointment, since he was my host in South America), and it would take me fifteen minutes to get to the hotel for that. Shoot. This was looking very ugly indeed. Finally, in a moment of unnatural clarity, I asked the Yamaha man if I could at least shoot some pics of the Fazer while I waited for Roberto. He batted not an eyelid and wheeled a bike onto the pavement. He warned me not to put it on the road itself, since the bike had no papers. Which is one of the two reasons for the slightly repetitive pictures that accompany this article. The other is that I am a poor photographer, especially when jumpy and nervous. As the lens zoomed into various parts of the bike, I had a moment to reflect at just how arbitrary the chain of events leading to the Fazer really was. I was returning from Volvo’s Curitiba factory the previous day, when I spotted the Harley-Davidson Curitiba outlet, not two blocks from my hotel. I walked back to it minutes later, and met Fernando Buffara, who without a moment’s hesitation put an English-speaking chap next to me, and proceeded to give me a detailed tour of the place. God bless you Fernando. 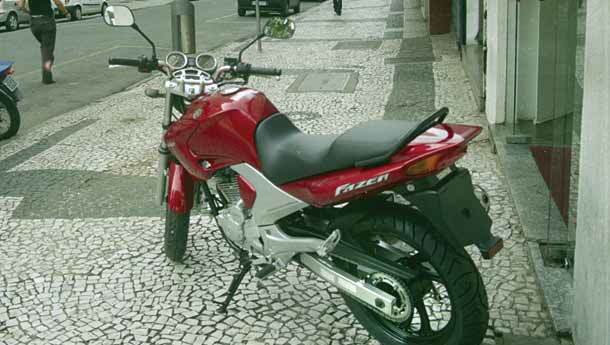 Then I asked the chap (ungrateful jackass that I am, I can’t even remember his name) about any friends of his who had a Yamaha Fazer 250. ‘Oh, that’s a badass, man. My friend has one, it’s awesome. And it’s even f***in’ fuel injected, dude!’ He made two calls, calling both the mates by their (apparently) F-word laden monikers and asked about the bike. Finally, he wrote down Roberto’s contact and address and said, ‘Go at eight-thirty, he’ll have a bike for you.’ Awesome. Then he sprang the monkey on my back. ‘Be careful, four of my friends have had their faces filled with guns in that area... and pockets emptied... going to school.’ Great, thank God I’m carrying Srini’s camera and not mine... But that still did not solve my problem, right? Pictures are pretty, and pictures are nice, but if I don’t ride it, no dice. As I rolled the motorcycle back into the showroom, I had pictures of a retro instrument cluster with its tiny LCD screen (which has a multi-function odometer and fuel gauge). For the record, the speedo is calibrated to 170 kph, and is redlined at 9,750 rpm. The first figure is way optimistic though, for everyone at the showroom shook heads vehemently and pointed firmly to the 140 kph mark. My halting grasp of the Brazilian tongue also brought out the fact that most customers reported fuel efficiency figures of around 22 kpl, although cheap petrol makes that fairly irrelevant. We went upstairs to the first floor service area where I watched the muscular engine of ‘my’ Fazer get an oil change, and then it was ready. I quickly donned the helmet they offered me, my own gloves and jacket and in a moment, I leapt onto the saddle. Thumbing the starter, I sat in the saddle, waiting for the engine to settle into a quiet idle. A minute later, I was waved off the showroom courtyard. Then it sunk in. I was riding a motorcycle in South America! The wind blowing into my not-quite-fitting helmet was Brazilian and I didn’t know my way around this place. Perhaps even more gripping was the fact that I was on board a motorcycle due for an Indian launch (all sources suggest) by either the middle of this financial year, or perhaps by March 2007. Not bad at all. I took it easy for a while, figuring out a loop I could cruise around without having to worry about getting lost. At this relaxed pace, you can quickly shift the Fazer into fourth and roll about at a lazy throb. It feels comfortable, at ease, substantial and very relaxed. Sort of Karizma like, even. Everytime you twist the throttle, you know that the motorcycle has a lot more grunt though, and there’s a refined surge that clearly shows off the sparkling 2.1 kgm torque peak at 6500 rpm. Once I got the hang of the streets, I rode faster. Roberto had pointed out the stretch where I could open it up with only a minor risk of persecution or prosecution. As the revs rise, the Fazer seems to uncoil out of its lounge stance and become more serious. The Yamaha is a proper zinger between 7000 and 9000 rpm. The exhaust note goes from a gruff throb to a fairly audible thumping as the ceramic-coated cylinder breathes deeply and races towards its 21 bhp peak and then past it, without losing much thrust. Not bad at all. It isn’t grippingly fast, but then again, that’s not the character it was supposed to have (see box: One chance). The Fazer has a nice and wide power spread and I suspect it would be outstanding in both commuter and highway roles in India. No doubt that 19 litre tank will be a great help when you’re out on the highway as well. A good part of that versatility is thanks to the (Indian) Fazer-spec comfy seat and stance. It’s an ergonomic tour de force of sorts and very welcome. Fuel injection aside, the engine is fairly straightforward, though high-tech in parts. The motor is a ‘normal’ oversquare oil/air-cooled single cylinder four-stroker, with a single overhead camshaft and two valves. However, for longevity and thermal stability, the cylinder is ceramic coated. The engine is mounted in a beefy double-cradle frame with a fat telescopic fork set up front and a monoshock at the rear. Like the top-line Indian bikes today, the Fazer features a two-calliper 282 mm disc up front and a 130 mm drum at the rear, with a first-gen Pulsar-ish exhaust, alloy wheels and rubber-topped aluminium footpegs (like the Enticer’s pillion pegs) and racy all-aluminium pillion pegs rounding out the bottom half of the bike. The top half is very close to our Fazer, but significantly wider. The tail panel and the tank are very close but somehow more contemporary and the tail lamp features integrated turn signals. The effect is contemporary, but the Fazer is not one of those Yamahas that causes dropped jaws, turned heads and yes, pools of drool. In the two-odd corners that I swept through, the Fazer felt stable rather than quick and very, very confident. The Pirelli rubber felt very sticky and the Fazer promises lots of high speed thrills when the space allows it. I won’t comment on ride quality, because the asphalt was smooth all the way on my short ride. How will it do in India? 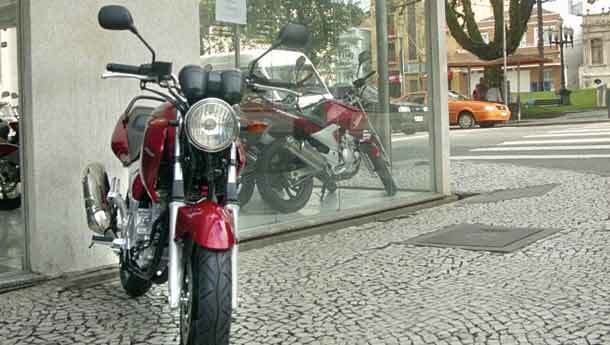 Brazil’s emission laws are fairly relaxed, and two-strokes are on sale there today. As such, the Fazer will have to be retuned to get past emissions, I think. Not by much, perhaps, but we may lose the odd bhp in transit. That aside, I only think a change of wheels is needed. The alloys look decidedly old-hat and the curved spokes that were cool on first-gen 1985 Gixxers are not anymore. We need a taut, light-looking straight-spoke pattern that’ll really jazz up the proceedings. 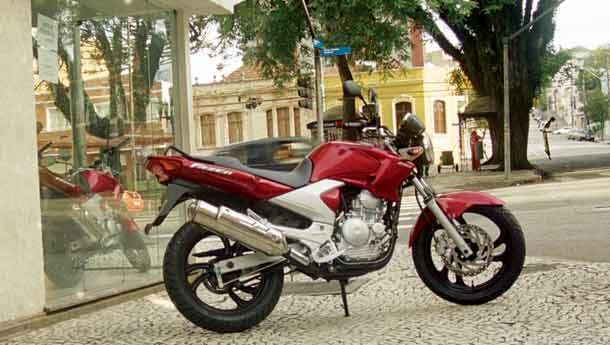 The Fazer retails for about 9951 Brazilian Reals, which is about Rs 2.23 lakh there. That price tag certainly won’t work here. Yamaha would do well to aim for a sub-lakh price tag, especially given that the market buzz says the Bajaj ‘225’ DTS-Fi is more than likely to be an about-90K bike. This is a really likeable motorcycle. And so were the people who were waiting for me on the kerb when I returned. Roberto took the bike keys from me, and I basically handed the lid back and raced into a taxi... I was already way late for the Volvo appointment. Still, job done.